Living at home, I often ate variations of this simply prepared yet flavorful dish. It was quite a hit during the sweltering summer months as it was light and made with a abundance of fresh ingredients. My mom would often make a huge batch at the beginning of the week so that there would be less cooking to do later in the week but it also worked well for the dish as this is one that tastes better with a little aging. 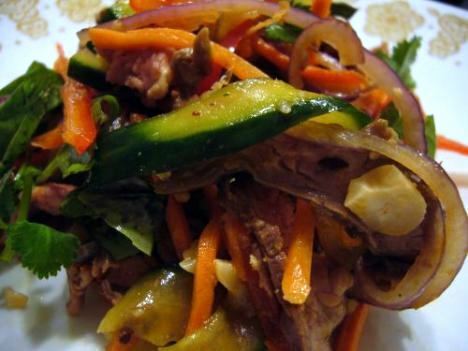 Even a trip to the local Vietnamese restaurant that served up 7 courses of beef called for some variation of the cold beef salad. It is one of my favorite Vietnamese dishes and definitely my most favorite course of the 7 courses of beef. Since this dish is very simple to prepare, I’d advise to not skimp on the freshness of your ingredients. The only thing that is cooked is the beef so the vibrancy of the raw veggies can really put on a show for the senses. You can enjoy this dish as is or to make it a more heartier meal say for dinner enjoy it with a steaming bowl of rice. Save some to marinate a few days in the fridge and you’ll notice that the intensity of the flavor has increased dramatically yet the veggies still remain beautifully colorful. I know its still winter yet I miss the flavors of my mom’s kitchen and I found some very pretty ingredients at Trader Joe’s so I couldn’t wait till summer to prepare this dish that is so dear to my childhood. Notice that I didn’t add fish sauce to the recipe for you seafood allergic Vietnamese food loving folks. You can add a couple dashes of fish sauce if you want. I choose not to since I’d take this meal with me to work and the fish sauce smell can be a little tough to get rid of. Combine light soy sauce, lime juice, water, sugar, garlic, and chili sauce/paste/oil and ginger in medium bowl. Whisk or stir to blend. Pour approximately 5 tablespoons into a resealable plastic bag or large container. Cover and refrigerate the remaining dressing. Add steak to bag/container, seal, and turn to coat. Chill 30 minutes or overnight (for a more stronger flavor) to marinate. Heat broiler to 400 degrees F. Broil steak 8 to 10 minutes, turning once, or until medium-rare. Let rest 5 minutes and slice thinly at an angle, across the grain. Place basil, cilantro, mint, onion, cucumbers, and carrots in large bowl and toss. Top with sliced steak, drizzle with reserved dressing, and sprinkle with peanuts. Can be eaten with a bowl of cooked rice or alone for a healthy low carb alternative. Let the ingredients mingle overnight for a more intense flavor. If you choose to do this then keep the basil, mint and cilantro out of the dish till you are ready to eat to keep them from getting droopy in the dish. Hey Liz, this sounds really good! I'm trying to cut down on carbs and am getting bored with my usual recipes, and this one looks like it will be very tasty. How come I haven't visited your site more often? Hey Foodhoe! This site is actually pretty new. I used to have another food blog by the name of Yummy 4 My Tummy. I'm also trying to cut back on carbs but the steamy bowl of rice caught me ... as well as the cookies and cupcakes.